F Simple and Serene Living: in a garden greenhouse. When I was a little girl my grandparents owned a florist and greenhouse business. Michler Florist is still here and owned by family members. It is where my love of gardening came from and as a child I loved to wander through the greenhouses smelling the plants and rich soil before I paused to sit by my grandfather at the potting bench. My father, with a young family built greenhouses for extra income, and we were lucky enough to have one in our backyard. I have never been fortunate enough to have another as an adult, but I love having one on my wish list. For me, opening the door to a garden greenhouse is like stepping into a world filled with beauty and opportunities. Each greenhouse is unique and filled with the aromas of its own flowers. I can imagine the sound of rain on this tin roof, while the moisture brings up the loamy smell of the earth. or just a sweet little space on a city patio. 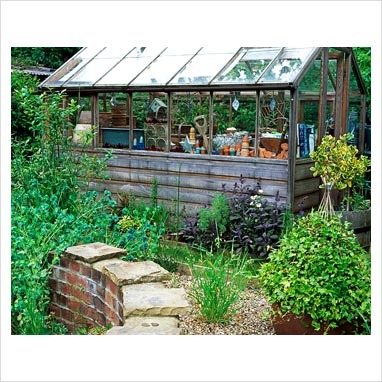 But, whether it is big or small, rustic or refined, a greenhouse is a place to step inside and dream of the possibilities. I agree. We once looked at a house that had a little tiny greenhouse on the side, just big enough for a small cafe table. We didn't buy the house, but I've always secretly longed for that little greenhouse. Wonderful additions to a wish list! I love walking through a greenhouse. I'm hoping to get a cold frame built this spring and I've gotta get my tomato and pepper seeds planted indoors TODAY! :-) Thanks for the fun photos. What a wonderful greenhouse. I would love one at my home. What a sweet memory! I hope you get a green house real soon! I find greenhouses whimsical. We live close by to one such beautiful greenhouse built by a Scottish lord who also built a mansion. They are now owned by the community so it is free for everyone to go in and enjoy the peach tree, the roses and the figs. There is even an herb garden that everyone can pick from. Lovely! Lucky you! You must have been a very happy kid! I hope you do get a greenhouse soon! I do hope that someday you will have your very own green house. In the town where I live there is an old run down nursery, with a large plastic covered green house. It is run by a woman who is some what lacking in social skills, but when you get her talking about plants, she is a total genius. An encyclopedia of plant knowledge. I love visiting her and getting her out of her shell and talking about all the different plant life. Most folks in town have stopped going to her business and shop instead at the big Home Depot, Lowes, and Walmart. It is such a same . . . because if they only spent a little time with her they would see the treasures she has to offer them. This time of year when I'm so eager for spring, I love to go out there and linger in her green house and plan my spring garden. I know what you mean by the smell of the sweet earth in a greenhouse, isn't it a sweet perfume, to those of us that love to garden. I agree that a greenhouse is something special. I still drive a distance to a nursery that has a large greenhouse just so I can enjoy going inside. We had planned to purchase a small greenhouse this year, but are making over our yard instead. Next year perhaps I will be fortunate to get a very small greenhouse. P.S. Have you seen Martha Stewarts greenhouse? It's amazing and definitely something to check out. Like your post about porches, my other dream would be to have a proper greenhouse ... I would throw tea and dinner parties in it all year round! With the cost of food getting higher and higher each day it is becoming more affordable to commit to the expense of a greenhouse for growing vegetables year round and saving some money on the food bill. All of your photos are great and really convey the greenhouse wish.